March 1, 2017 By Chelsey 1 Comment This post may contain affiliate links. Read my disclosure policy here. 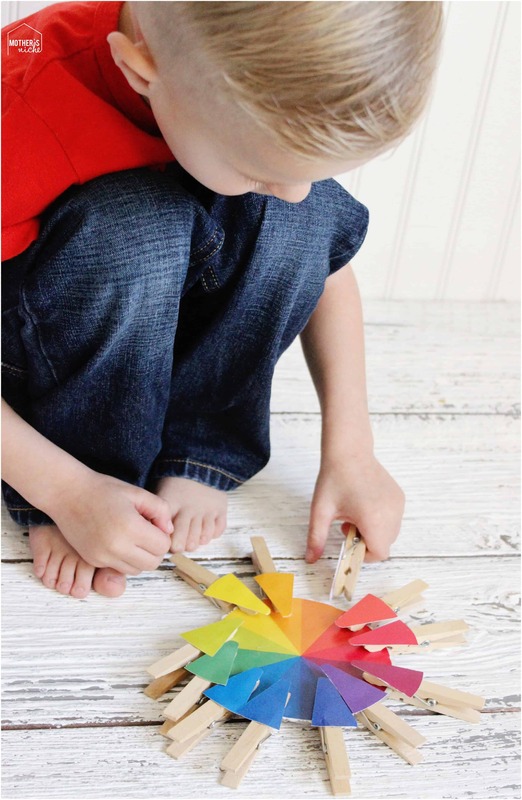 A color wheel is a fantastic and fun way to teach colors, blending colors, primary and secondary colors, complementary colors. With the use of the clothes pins it also teaches fine motor skills. This can be an activity the kids can grow with, continually teaching new skills according to the child’s age. Print one colored copy of the free printable on white cardstock paper. Cut out the first color wheel leaving it as a circle. I laminated this piece for extra durability. Cut out the second circle then cut the individual colors on the lines. I rounded the tips off to prevent bending. Hot glue the individual colored pieces to clothes pins. That’s it! You’re ready to play! My son loves this game! We take three colors next to each other and talk how the middle color is a mix of the two outside colors. Talk about thing in the house that are the same colors as the paper clip. We walked around the house pinning the clothes pins on items that matched. My son put the green clip on the plant in the kitchen. The pink on his sister’s shirt. The blue on the skirt I was wearing. The yellow on the dish clothing hanging on the stove. Then, we raced around the house recalling where each on the clips were hanging. It turned out to be a really fun memory game. There are tons of things you can teach with this simple tool. We love it! 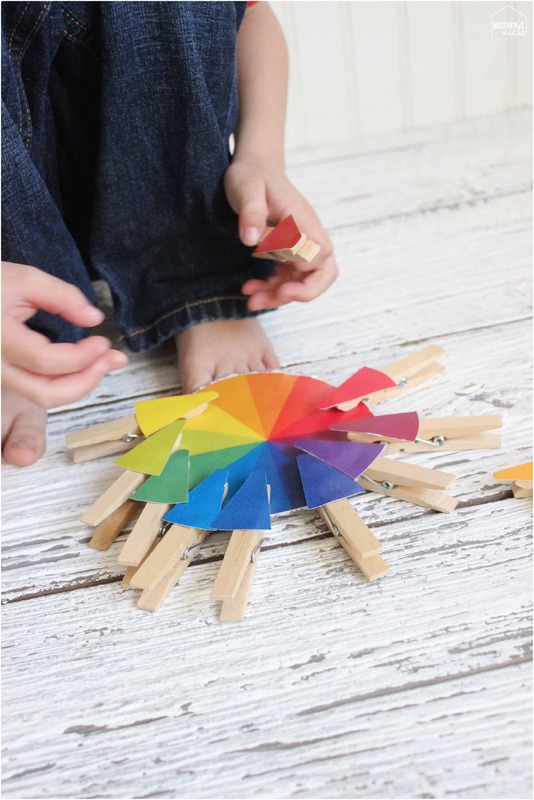 You can also teach the color on the rainbow and help them line up the pin in order without looking at the color wheel. As you can see there are so many fun ways to play with this simple learning game. What games would you play with this activity? 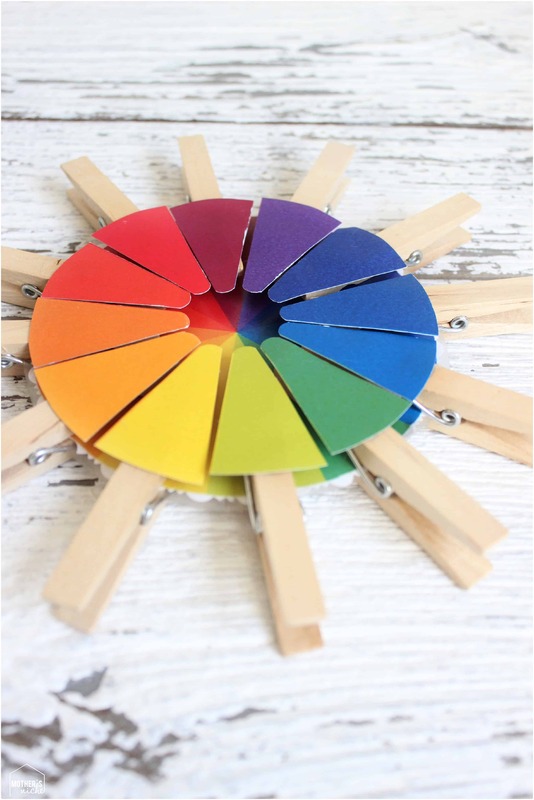 GET YOUR FREE PRINTABLE COLOR WHEEL HERE! What are some of YOUR favorite color activities?! 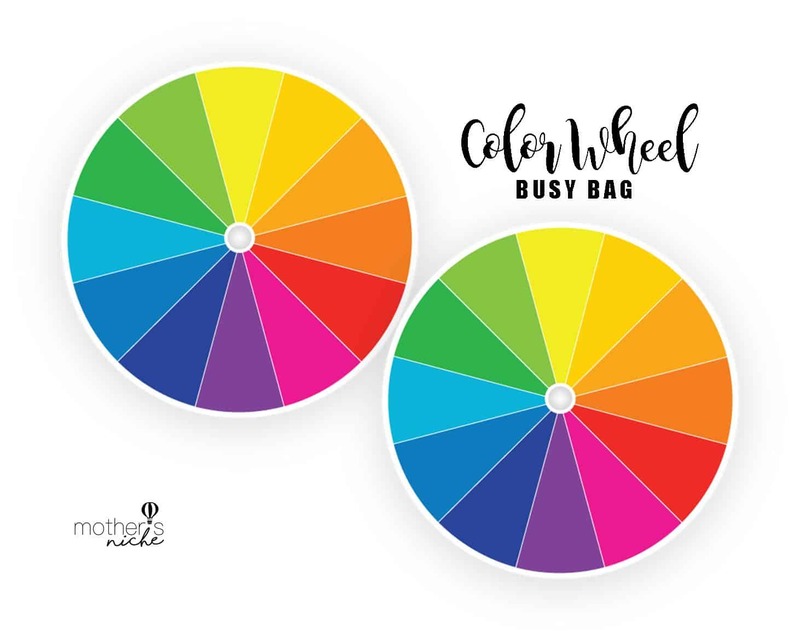 I love the idea of busy bags! I’ve been trying to make intricate ones, but this is so simple! Thank you for the PDF! My daughter has already started using it and loves it. Do you ever use busy bags for older kids? If so, what do you use?